The Thunderbolt started their 2018 season with a 3-1 Injury Fund win over Scituate. Here, Angel Lopez takes a perfect pass from Kerin Murillo and heads it by the Spartan Goalie for a goal. Bolts and Falcons play to 2-2 tie! With neither team garnering many shots, the Bolt and Falcons played to a 2-2 tie. The Thunderbolt are now 7-2-2 (23 points) and the Falcons are 3-2-5 (14 points). The annual City Cup was decided in penalty shots. Despite jumping out to a 3-2 advantage after three rounds, Cranston East missed three consecutive shots while Cranston West tied it up at 3-3 in the top of the fifth round and won on shot by senior Alex Lopez in the top of the sixth round. After scoring 27 goals and recording 33 assists in Division III competition over the past two years, Junior All-Stater Kerin Murillo leads R.I. with 18 goals & 5 assists in league play. Kerin Murillo scores one of his team-leading 18 goals against Davies in a 6-3 victory for Cranston East in the fall of 2017. ​Richmond Miamen scores the most important goal of his career in an overtime win over Burrillville in the 2017 Quarter-finals. ​ Head Coach Richard Grenier is in his 6th year at the helm of the Thunderbolt Soccer Program. In 25 years as a Soccer Coach in the RIIL, he has recorded over 250 RISCA victories and a career record of 280-124-79. He has directed his teams to 24 playoff appearances, 9 sportsmanship awards, 6 state final appearances, 3 state championships, 15 semi-final appearances and 10 Cranston "City Cup" Championships out of 14 games played. He has the distinction of being the only RISCA coach in the history of Rhode Island Boys' Soccer to have three different teams (Cranston West Falcons in 1996, West Warwick Wizards in 2007 & Cranston East Thunderbolt in 2014) awarded the RISOA (soccer officials) Team Sportsmanship Award, as well as three different schools win State Championships (Cranston West in 1996, West Warwick in 2004 & Cranston East in 2017). ​Matt Grenier, who holds career records at WWHS with 376 saves, 38 wins & 20 shutouts, continues as the Bolts Assistant Coach & Junior Varsity Head Coach. In his first year, he posted a 9-1-6 record. ​Jake Leander is playing for CCRI this fall. The former All-Division defender, will continue as a volunteer coach for his third year. ​Pat Finucane, who anchored one of the best Bolt defenses in 2015 , earned All-Division honors in 2014 & 2015. He joins the Thunderbolt staff as a volunteer coach in 2018. 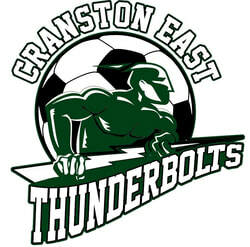 ​The Thunderbolts of Cranston East, who had a 31 game streak without a card spanning from 2013-2015, have received 22 cards over the past six seasons (107 games played). Giovanni "Gio" Canales, who earned First Team All-Division honors for the Bolt Soccer team in 2016 and 2017, will focus on baseball full time this fall. He ended his soccer career with 330 saves, 11 shutouts and 25 wins. Recently, Canales confirmed that he will take his baseball talents to Coppin State University in the Fall of 2019.